Ezy Mats is a supplier of a large range of foam mats. Whether you require a single foam mat or foam mats Ezy Mats has you covered. Our mats come in a number of different thicknesses. The thickness of the foam mat is determines by the user and it is important to understand your needs before purchasing your gym mats. The different thickness absorb different amounts of impact. The thicker that mat then logically the more impact that can be absorbed during training and vigorous activities. 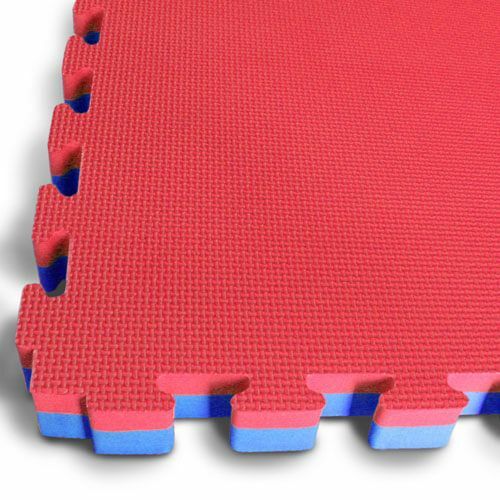 A foam mat is a mat or set of mats used in martial arts and gym training. An foam mat is made of EVA foam which is an expanded foam which absorbs impact like jumping or falling. EVA is a form of plastic but with absorbing qualities which make it a durable and flexible product. EVA foam is an ideal material for absorbing impact and is ideally suited for training mats. They have been used for training mats for a number of years now and have a proven track record. EVA has a variety of applications with different manufactured products. 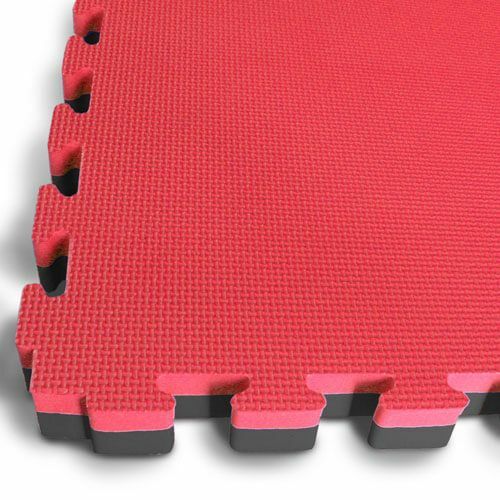 A EVA foam mat employs a jigsaw system which allow the gym mat to be conveniently interlocked with other mats. EVA is also easy to cut to size of you need to fit them it irregular spaces. Our foam mats have the added benefit of being interlocking mats. This is the reason they are referred to as jigsaw mats as they lock into to each other for stability just like a jigsaw puzzle. The difference being that each mats is identical so that are easy to lock together. It is for this reason that our foam jigsaw mats are easy to assemble for use in both short-term and long-term training areas. Assembling interlocking mats doesn’t require and special skill and can be undertaken by almost anyone. The interlocking aspect of them also ensures that the mats don’t come apart during training like other non-interlocking mats. This makes training a lot easier and safer then traditional mats without the interlocking mechanism. As previously stated the foam mats are available in three different sizes: 20mm, 30mm, 40mm. They are 1m x 1m in size (slightly larger with the edging attached). When connected together they a accomodate any area required. Generally speaking (but not exclusively) the 20mm foam mats are used in activities where the is less fatigue and minimal falling and jumping. The user can move up to a 30mm foam mat which is ideal where there is more jumping and where there is some potential for light fall. The 40mm EVA foam mats are generally required where there is falling and rolling around on the mats. As the intensity of the activity increases so too does the thickness. It is imperative to understand the potential dangers involved with your activity before deciding which mat to use. Our foam mats are used in a variety of training including gymnastics, gyms, aerobics exercise, pilates, cross-training, boot camp training etc. These mats have been sold to organisations as diverse as the police, hospitals, schools, daycare centre and every conceivable martial arts organisation. If there is an activity that requires ant-fatigue or safety qualities then there is a good chance that foam mats will help. Ezymats endeavour to be the most economical supplier of interlocking foam jigsaw mats in Australia. We promise to do our best to beat any reasonable quote for the same product. Should you find cheaper mats elsewhere please contact us for a quote. We are also happy to consult with your needs and to answer any questions you may have about training mats. Generally speaking these mats are the most price effective way to fit out any training area with training mats. As they are made from a single material and not a combination of materials the manufacturing process is inexpensive. Also the huge popularity makes for economies of scale. EzyMats has two warehouse located in Sydney and Melbourne. Mats can be picked up from both locations. We require prior notice so that we can confirm stock availability. Although we have shipments arriving on a fortnightly basis we can sometimes run out of mats. If the mats are not in stock then a pre-order can be placed to ensure that the stock is reserved when it arrives. Otherwise there is always a chance that the back orders from other customers will require all the mats arriving. If stock is confirmed that pick up is more then welcome. We accept both cash and credit card payments for pick ups. If you need to pay via direct transfer then allow a couple of days for the funds to be cleared. EzyMats can also arrange for delivery Australia-Wide. We have delivered mats to all corners of this great country of ours, from major cities to the most remote areas. If there is a road that leads to a destination and a courier that will delivery then we can arrange it. We have a freight calculator in the check out area of the website which can calculate freight using TNT’s API feed. The rates are competitive as we receive a discount from TNT which we pass on to our customers. Should you require more shipping options then we are happy to arrange additional quotes through Nations Freight Management. This will give you pricing from multiple freight forwarders and therefore the most competitive freight quote. Please contact Ezymats before making your purchase from another supplier and you won’t be disappointment. We are happy to look at any genuine quote you have received and will do our best to match or beat. Whether you are a large organisation or small we are here to help you. Ezymats are one of the largest suppliers of training mats in Australia.